Home > Learn > The Basics > Alzheimer's FAQs > What are the stages of Alzheimer’s and dementia? Alzheimer’s disease and the other dementias are usually slow and progressive illnesses. The average length of life after a diagnosis of Alzheimer’s is eight years, although many people live much longer. While there are different theories and views of staging, many senior care professionals, including David Troxel, co-developer of the Best FriendsTM Approach to Alzheimer’s care, believes that understanding three basic stages can help families prepare for the caregiving journey. In this stage, people with Alzheimer’s retain some insight into their situation, but are getting more and more confused and forgetful. They may begin to lose language skills, have trouble handling money and paying bills, forget once-familiar tasks and have some personality changes. One woman Troxel worked with said her mother was “fighting the battle” during this stage. She knew what was happening and fought to keep her independence. During this stage it was tough for the family to manage issues around driving and money management, but with honest and caring communication the mother finally accepted their help. People in early-stage dementia can retain enough function to fool family and friends about their condition. But the game is up in stage two, marked by significant memory loss and confusion. Dad may forget or not recognize family and friends, repeat himself often, and have problems sequencing tasks like putting on clothes in the wrong order. He begins to lose independence. It is no longer safe for him to live alone and manage his own affairs. No wonder this is the point at which most families intervene and seek help for their loved one. They may arrange a power of attorney in order to manage finances, and turn to an adult day center, in home senior care provider or residential care community during this stage of dementia. Socialization and support are important at all stages of the Alzheimer’s journey, but they are a key intervention during middle dementia. Structuring the day, arranging activities, and preventing isolation are important goals—goals that in home workers who have completed the Home Instead Senior Care® network’s Alzheimer’s and Other Dementia Program support. Besides offering daily assistance with dressing, bathing, meal preparation and other tasks, these trained CAREGiversSM know how to plan activities they and their clients can enjoy together and how to have fun with their clients. In many ways, Alzheimer’s can be considered a fatal illness. Late in the illness, the person is more prone to falls and infection. The swallowing reflex often declines, making the person vulnerable to aspiration pneumonia. While the person has experienced some incontinence, now he or she may lose full control of bladder and bowels. Caregiving becomes quite profound and focused on physical care and well-being. Although the person may not recognize family or friends, it’s important to continue expressing love and affection. There’s still a person inside, who needs dignity and respect. Of great help during this final period are hospice services, which can provide excellent medical, spiritual and social care. “Supportive companions are important no matter where your family member is in this long journey,” says Troxel. “Building a strong network of caregivers, support groups, and friends can help a family prepare for and address needs and challenges at every stage of Alzheimer’s.” To find support groups, contact your local Alzheimer’s Association chapter. 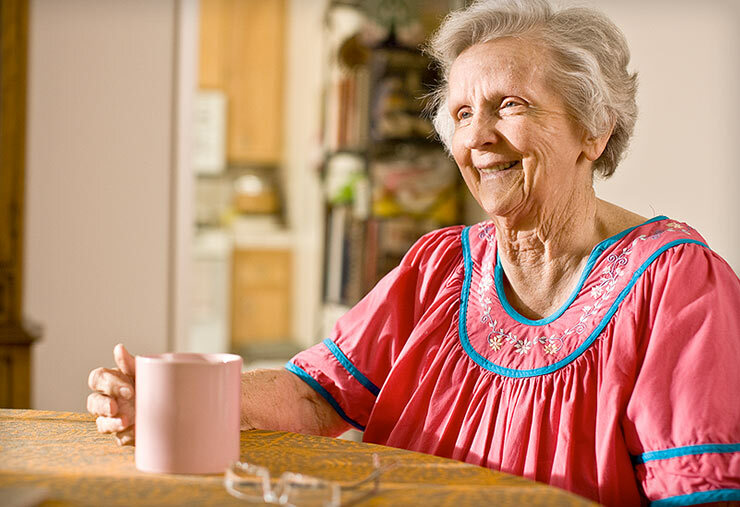 To find in home care support, contact your local Home Instead Senior Care office.